We members of the 9th Infantry Regiment (Manchu) Association, United States Army, pledge to preserve the history and name of “The Regiment”, and to support the Constitution of the United States of America against all enemies, foreign and domestic; to support our Active 9th Infantry Regiment (Manchu) soldiers and the United States Army Regimental system. We shall promote comradeship and esprit de corps among our members; set examples of unselfish patriotism, and memorialize the patriotic deeds of the members of the 9th Infantry Regiment. A Call for Photos and Other Contributions ! Keep Up The Fire ! 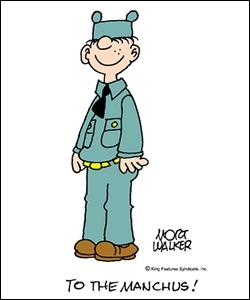 BEETLE BAILEY IS A MEMBER OF K COMPANY 3/9TH BATTALION NINTH REGIMENT (MANCHU).HE WAS CREATED BY MORT WALKER WHO HAS GRACIOUSLY GIVEN US PERMISSION TO USE HIS CARTOON. For a full list of Manchu Merchandise, click here. We are looking for content to add to the site, please send us any photos, manuscripts, and other content that you would like added to our donate page. Please be sure to include any notes or comments that you would like published with the content. 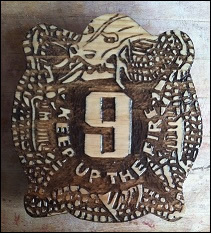 Purposes of The Manchu Association are to preserve the history and name of The Ninth Infantry Regiment (Manchu), to support the Constitution of The United States of America and continue to support the Ninth Infantry Regiment (Manchu) members and the United States Army Regimental System. Objectives of The Association are to promote comradeship and esprit de corps among its members, to set examples of unselfish patriotism and to memorialize the valiant acts and patriotic deeds of members of The Ninth Infantry Regiment (Manchu). We would like your help. If you have information to share on the Ninth Infantry, feel free to contact us. Thank you, in advance, for your assistance.